Zhuang Liehong was one of the four main leaders of the 2011 uprising in Wukan Village, China’s most widely publicized rural struggle of the past decade. Born in 1983, he left home after junior secondary school, like most teenage villagers, to work in the nearby Pearl River Delta (PRD). After a few years of saving up money, he became a shopkeeper in Foshan. Over the course of a series of land grabs in his home village (taking place since 1993), his parents lost their farmland, thus reducing their income to remittances from Zhuang and one of his brothers. With the economic slowdown after 2008, however, Zhuang’s business barely managed to make ends meet, so when fellow villagers began protesting the land grabs in 2009, he joined their cause, teaching himself to use video equipment and co-producing two short documentaries about the dispute. When the conflict escalated in September 2011, Zhuang again rushed home to play an active role in the struggle, being elected to serve as one of 13 delegates to negotiate with the officials. On December 3, he was arrested for circulating a manifesto that helped turn the protest into a mass movement. In response, villagers took several officials hostage, demanding Zhuang’s release. After the movement finally ousted Wukan’s ruling clique and organized the village’s first democratic election in March 2012, Zhuang became one of seven members of the new Village Committee (equivalent to a village-level government). After nearly two years of negotiating with the companies that had leased Wukan’s collective land and the officials who had colluded with the old Village Committee, the new Committee managed to regain only a fourth of the stolen land, and some of the movement’s other demands remained in limbo. As the 2014 election approached, higher-level officials began harassing the new incumbents who had been active in the movement, detaining two of Zhuang’s comrades on bribery charges, for which one was eventually sentenced to four years in prison. Zhuang fled to the US, applying for political asylum and getting a job at a restaurant. His application is still pending. 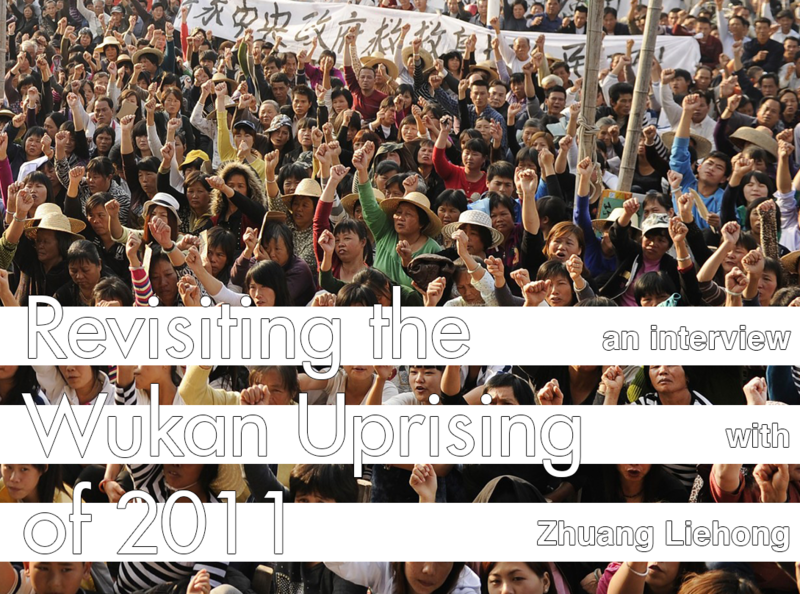 On October 31, 2015, our friend Guiling, who had met Zhuang during the uprising in 2011, had the opportunity to catch up with Zhuang and ask about some points that remained unclear in the existing literature on Wukan. Below are translated excerpts from the interview. Part I is transcribed from their meeting, and Part II is translated from email exchanges. Guiling: What are you doing here in America? Zhuang Liehong: Now I’m delivering food for a Chinese restaurant. I just bought a car and my working hours are late. Usually I start working at 4 pm and go back home at 10 pm. We got some low-income insurance here. G: What’s the situation in Wukan now? Are you still in touch with people there? Z: Wukan’s struggle is completely over—the last nail was hammered into its coffin long ago. No changes have been made regarding the land dispute. My friend Hong Ruichao is still in prison. I think he has another two or three years to serve. I still have relatives living in Wukan, but no one is involved with the land struggle now. As far as I see it, the struggle was already doomed from the beginning. Chinese peasants… they really don’t know how to fight, and things fell apart soon after the movement begin. Everyone has their own motives and interests. As for the media, of course they stop following as soon as there is nothing sensational to report. Peasants have always been the ones to be exploited and oppressed throughout Chinese history. G: What does the land mean to younger villagers? Z: Most of the younger villagers work in big cities like Guangzhou, Shenzhen and Foshan. Some of them run businesses, like in the garment industry. They don’t regard themselves as “peasants” (nongmin) anymore. But the economic situation in those big cities is bad. You know, Guangdong’s economy isn’t really growing anymore, so those young people have to return to Wukan. Some may try their hand at fishing or aquaculture (dayu), since no one farms the land anymore. Many of the returned youth are living off their parents, just “gnawing on the elderly” (kenlao). But this doesn’t mean that people don’t have any feelings for their land. In my case, for example, the land belongs to my family, so I have to do something with it, even if it’s not farming. G: Why didn’t Wukan unite with other villages involved in struggles at that time? Z: That’s a good question. Actually we did get in touch with other villages and planned to unite somehow. But after some discussions and re-thinking, we decided against it. We didn’t want escalate the situation and change the “character” (xingzhi) of our movement. As you know, the county’s party leader, Zheng Yanxiong, was worried that this struggle might ruin his political career, so he sent all those armed police to suppress the movement as fast as possible. So if we united with other villages, it would be considered an upheaval against the regime, and Zheng would have a perfect legal excuse to adopt even more violent measures. We didn’t want that happen. We wanted the movement to stay under control. G: Many land-related struggles have occurred since the 2000s, but Wukan’s case is the most famous. What is unique about Wukan? Have you heard of similar struggles elsewhere? Z: This has a lot to do with our use of the media and our own publicity efforts, based on our experiences of over ten efforts at petitioning the government over the previous three years. In our publicity efforts, younger villagers’ use of technology and the internet was crucial. I hadn’t heard of other such struggles in other places before [ours], probably due to China’s internet censorship. Only later did I learn of a few similar struggles through interaction with journalists. G: Many foreign journalists presented the Wukan incident as a movement aimed at “fighting for democracy,” with “fighting for the right to vote” as the means to this end. Other sources have said the goal was to regain farmland. According to your experience, which description is more accurate? Z: As a villager of Wukan, my original aim was to regain the land that had been stolen and sold by the government. Of course, this touches on issues of democracy: the lack of democracy means that village affairs are not transparent. This is one of the reasons that the land could be stolen and sold behind the villagers’ backs. In my opinion, as far as we villagers are concerned, the real goal concerning our immediate interests was to regain our land, and democracy was just a necessary condition toward that end, and toward preventing similar losses in the future. G: What role does land play in Wukan villagers’ lives? How many people still make a living from farming? What portion of the household income derives from farming? Z: Farmland has never been villagers’ only source of income in Wukan. Compared to neighboring villages, Wukan is coastal. Earlier generations were basically half-farmers and half-fishers, with farming and fishing each providing about half of a household’s income. Our standard of living was much higher than villages depending on farming alone. Even so, villagers still regard farming as the root of life, and “the sea” as [a place of] begging, so some refer to fishing as “begging from the sea” (tao hai). Since the 1980s, the rapid development of the Pearl River Delta attracted young people to give up farming and seek development there, but older people continue farming and fishing. Household incomes long ago ceased to depend entirely on farming. Then the government built roads that cut off Wukan’s natural water sources for irrigation. This was called “using land to cultivate roads” (yi di yang lu). So most of Wukan’s farmland fell into disuse. Now the amount of income that households derive from agriculture is almost nil. G: Do the young people of Wukan know how to farm these days? As far as I know, most do not, yet they played an especially active role in the protests. What do you think the land means to them? Z: For young people nowadays, the generation with no experience farming, even if they have farmland and can’t find a job, they’re still not willing to try their hand at agriculture. In my personal experience, after wandering far from home for many years, it was only by returning home to Wukan that I could feel secure, like a boat coming into harbor. That may be why young people played such an active role in Wukan’s land struggle. G: How does your parents’ generation regard the loss of land? How does their perspective differ from that of young people? During the struggle, were there any generational conflicts regarding methods or ideas? Z: My parents’ generation’s perspective on the loss of land is shaped by all they’ve invested into the land, such as decollectivization in the 1980s, [and during the preceding collective era,] bringing new land under cultivation, improving irrigation infrastructure, etc. My parents’ generation sacrificed their sweat and blood for these projects, so their perspective differs from that of younger people who have been wandering around outside for many years. But no conflicts emerged during the land struggle. G: Did the migrants from Sichuan and Hunan [who rent offshore fishery plots from the Wukan collective] participate in the movement? Z: Yes. Nearly a thousand migrants live in Wukan. Some of those from Sichuan, Hunan and Henan who had lived in Wukan for over ten years became especially active in the land struggle. I was deeply moved when two or three women from Sichuan accepted interviews by the media. G: Your documentary film Wukan, Wukan! is the most detailed record of the event that we’ve seen. Could you tell us about the production process? What do your comrades think of it? Z: When we (non-journalists) were making Wukan, Wukan!, our main concern was to present a clear timeline and an accurate, easy-to-grasp account of the situation. Everything in the film was either recorded by us or collected from other villagers. Since we are not professionals, we fumbled through the production process through trial and error. […] I taught myself how to use the software [in 2009] when I was producing the videos To Be with Wukan and Dark Dream of Lufeng in Foshan. In order to fulfill the technical requirements for making these videos, I bought two high-quality desktops […] in Foshan. Zhang Jianxing helped me add narration. Together we also edited the timeline, images and videos. Our fellow villagers were very supportive of the documentary production process, and as far as I know, their responses to the final product were positive. They didn’t know it was made by us at the time. In order to avoid unnecessary trouble, we told them that we hired some professional video makers from other places. G: Have you watched other documentaries about Wukan, such as those by Al-Jazeera? What’s the difference between your documentary and those? Z: I didn’t know of any other documentaries while I was making Wukan, Wukan! Later I watched Wukan parts 1 and 2 by ISun Affairs. Compared to our documentary, theirs was more standardized (guifan) and artistic (wenyihua). Although their documentary may be more attractive for the audience, I think ours is a more complete and realistic record of the whole event. G: What do you think of the media’s collective silence after the movement? Do you think the media have misrepresented Wukan? Z: For outsiders, I think such silence after a struggle is normal, unless there are some new developments that the media deems newsworthy. As for [China’s] domestic media, that’s not even worth talking about. From the start they distorted everything, misleading society’s impressions of Wukan and our struggle. There were some inaccuracies in [foreign] media reports that failed to do in-depth investigation. Some exaggerated the facts and distorted the aims of our land struggle. But overall, most accurately conveyed our dire situation, attracting attention and concern from people everywhere. This indirectly saved us from further persecution at the time or even a massacre. For an overview of the Wukan Uprising, see “Gleaning the Welfare Fields” in this issue. Xingzhi (性质) is a word often used in the Chinese state’s categorization “mass incidents” in order to determine appropriate measures for mediation or suppression. The most severe xingzhi is “subversion of state power,” which draws the bottom line for every legal issue, but in a way that appears highly subjective and ambiguous to ordinary people. Participants in “mass incidents” are thus fearful of crossing that line. Mr. Z’s choice of this term reflects such concerns about the struggle’s legal categorization. Bold indicates our emphasis here and below. The film is online here: <https://www.youtube.com/watch?v=11e9bWGvh00>. These earlier videos circulated via QQ groups of villagers who had already become concerned about the land grabs in 2009, when an earlier round of petitions and protests took place. Another villager active in the 2011 movement. Lin Zuluan is a sexagenarian party member who had nevertheless been excluded from the ruling clique of Wukan, probably because he had spent most of his adult life doing business outside the village. After retiring and returning to Wukan, he joined the rebellion in 2011 and was popularly elected as one of the 13 delegates to negotiate with authorities in September. When the movement ousted Wukan’s ruling clique in December, the Shanwei Prefecture branch of the CCP appointed Lin to replace Wukan’s incumbent party secretary. In the popular election of March 2012, he was elected as head of the new Village Committee. Later, villagers accused him of corruption, selling out the movement and sabotaging the negotiation process. Xue Jinbo was the butcher and movement leader (one of the 13 delegates) who died in police custody on December 11, 2011, his body showing signs of torture according to one coroner. It was news of this that incited the protesting villagers to oust the Village Committee, force police out of Wukan and block roads, in response to which a thousand armed police came and laid siege to the village on December 13.